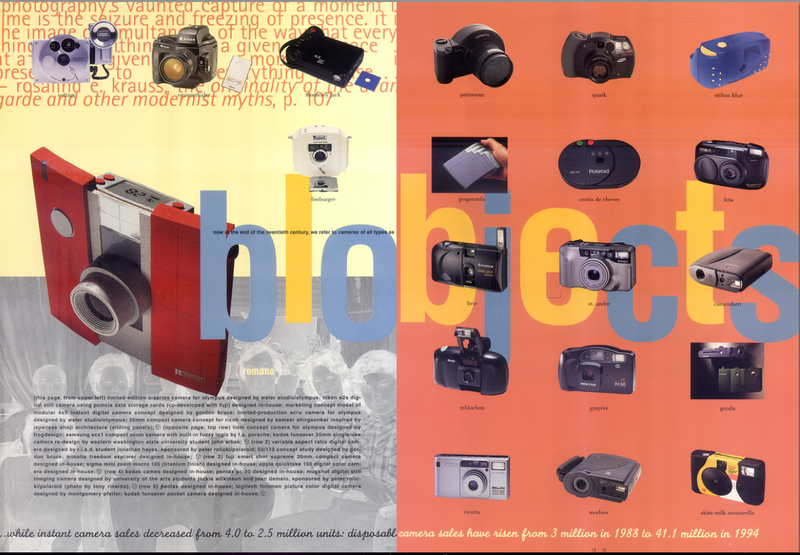 Toward the end of 1993, Graphis magazine offered The Professor a project to produce a column on products. It was a bold move on the part of Graphis to look outside of their editorial comfort zone and put their faith in The Professor. The magazine had a reputation as the staid grand dame of graphics publications: elegant, enduring, tightly controlled, classy, pledged to stiff consistency and living by high standards. No post-modern playfulness there. The Professor further inquired to the Publisher as to whether they would trust him with the entire concept, text and lay-outs: The Professor wished to completely conceptualize, photograph, write and design four pages in each issue [with art director Gregory Hom]. The response from Graphis was ‘Yes,’ and their leap of faith cinched the deal. The Professor decided to call it “infoscape” [‘information landscape’] and its focus was on expressing how the emerging paradigm of new media were influencing old media; how the internet and the web were specifically inspiring printed publications to change, grow and further develop their accessibility, hierarchy and information quotient. Put another way, look at the page as a graphic user interface. It looked to be too good of an opportunity to pass up, a chance for The Professor to contemplate the nature of what designers do from the inside looking-out; it turned out to be a two-and-a-half-year experiment in what he and Gregory could get away with within the hallowed pages of Graphis, It also turned out that [to be brutally honest] during the entire 12-part lifespan of the column that few people read or even acknowledged its existence; readers supposedly thought it was an advertorial and flicked past it and The Professor received only the barest trickle of feedback. In 1995, after already having produced a number of infoscape columns, The Professor was searching [as he most often did in those days, and still aims to] for a pattern that would connect work coming from the U.S. west-coast-based Art Center College in Pasadena with that coming out of the eminent Royal College of Art in London. He ended up writing about compelling concept cameras from both schools; he then combined the student projects with a number of the more boundary-pushing yet commercially-available professionally-designed units to show where he felt the use and design of cameras was going. Cameras were moving away from the use of overt geometry to express the machine precision of the camera mechanism writ large, and toward a new, still-evolving form language premised more on human anatomy [curvilinear shapes] and manufacturing and technology advances. 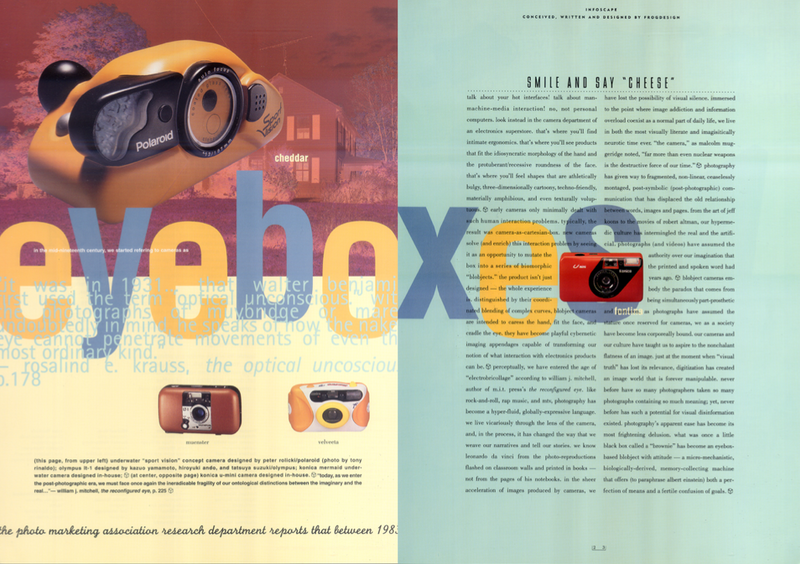 The Professor’s focus was on how cameras had become ubiquitous and how, in the process, they became little laboratories of creative exploration; new form factors, newly miniaturized sensors, tech advances in storage, and more. As we have discovered when we closely examine other advanced products, cameras are far from being a benign technology; they have both direct effects and unintended consequences. These cameras from the mid-1990s prefigured the ascent of today’s personal cameras, especially their integration with cell phones and their growing embrace of digital technologies. No one that The Professor was aware of was looking at cameras in 1994 as a key info appliance [either as a dedicated photo device or as an adjunct to a feature-rich electronic product]. Just as they had done before, cameras changed how we understood ourselves in the 1990s, how we interacted with the world, how we determined what was real, and how we constructed the strange, the audacious, the newly beautiful and even the sometimes questionable. Why? Because that’s where the art was. Part and parcel of this transformation was The Professor’s ongoing thesis that the visual literacy of young adults and children has been inexorably on the rise since the early 1980s, and that hardware-software combinations [such as these cameras represented] tied directly into the rise of visual literacy. So, when The Professor looked back at this particular column recently, he found that much of what was said then was still germane now. We should extrapolate what works from those mid-1990s cameras and integrate that into other consumer products. This column on cameras also represents one of the earlier published instances wherein The Professor proposed the “blobject” as a new formal archetype; in this look at cameras, the natural focus was on blobjects that could be easily held, displayed, used, put away, and personally [or emotionally] identified with. Further, The Professor had proposed the concept of “emotional ergonomics” in the mid-1980s and never really developed it; this infoscape column “Smile and Say ‘Cheese’” provided a chance to look further into how that approach was being expressed, especially in the student work [since it operated outside of market concerns]. It is The Professor’s intent to eventually present all 12 of the infoscape columns again at this web location. They will be presented unchanged from the original, with any idiosyncracies, misspellings and punctuation errors left intact and unchanged [despite The Professor’s gritted teeth]. That’s what he was thinking 20 years ago—and that’s why they call him The Professor. n.b. The term “electrobricollage” is from the book by William J. Mitchell: The Reconfigured Eye, “Beginnings,” p.7, MIT Press, 1992. The quote from Malcolm Muggeridge is from the only book given [the year it came out] to The Young Professor by his Grandmother Humphrey: Things Past: An Anthology, ed. By Ian A. Hunter, “Newzak,” p. 210, William Morrow and Company, 1979. It has occurred to The Professor since then that the social critic Malcolm Muggeridge can be seen as the anti-McLuhan, someone who saw the dangers inherent in the rampant propagation of the self-image, someone who saw cameras specifically [and media technology in general] as a dehumanizing, debilitating and stupidity-engendering force whereas Marshall McLuhan saw the optimistic possibilities for progress and the liberation and extension of what it means to be human through media. It is The Professor’s belief that they are both correct.